This is my first ( and possibly last ) attempt at wire wrapping anything… I’m a little excited because it worked!! I also can’t quite believe that I managed to pull it off – Yay me! I’ve had this stone pendant for a while now and never really knew what to do with it. I’ve tried incorporating it into other bits I’ve worked on and it just never looked right. 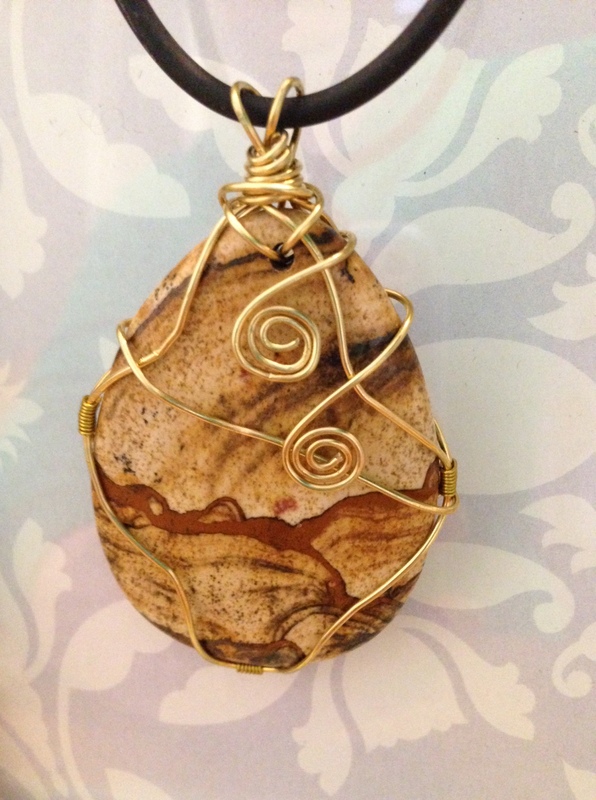 Then, of course, I started blogging and came across loads of super talented jewelry artists who wire wrap stones and that gave me an idea for this particular pendant. Now, I’m HOPELESS with wire, but I had a bit in my stash so I got onto YouTube and found this tutorial, which seemed simple enough for me to follow and tried it out. AND IT WORKED! Mind you, I have a few more scrapes on my hands now, and I used a few not so ladylike words while I was wire wrangling wrapping, and the back is really rather messy… but I did it! As fun as this was, and as much as I like my finished pendant, this wire wrapping shenanigans definitely isn’t for me… From now on, if I want a wire wrapped something I’m going to buy it from a professional, and save my hands, and nerves, for seed beads. A great WordPress.com site is a great outlet for me to post all my creative projects. Crochet, Crafts, and posts about life's other many joys. Beading problem? What beading problem? sewing, sewing and more sewing!